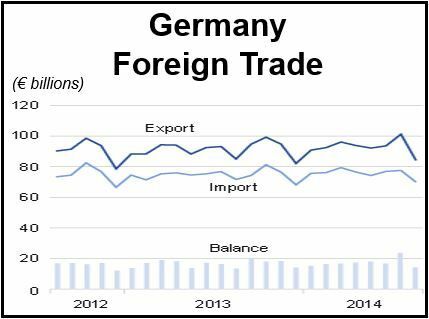 German exports and imports fell by -1% and -2.4% respectively in August 2014 compared to August 2013, the Federal Statistical Office (Destatis) reported on Thursday. August saw the biggest export slump since January 2009, in another sign that Europe’s largest economy has not managed to recover since its GDP shrank in the second quarter. German exports in August totaled €84.1 billion in value and imports €70 billion. After making adjustments for calendar and seasonal factors, exports fell -5.8% and imports -1.3% compared to July 2014. Destatis explained that one reason for the steep fall in international trade was the late school summer vacation in many Länder (German states) this year. International trade refers to the buying and selling of goods and services between between countries, i.e. imports and exports. 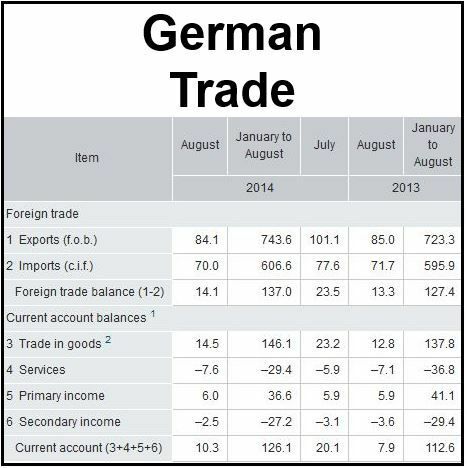 In August, 2014, Germany posted a trade surplus of €14.1 billion, compared to €13.3 billion in August 2013. After adjusting for calendar and seasonal variables, the trade balance for August 2014 was €17.5 billion. The Deutsche Bundesbank announced (provisional results) that the current account of the balance of payments showed a €10.3 billion surplus in August 2014, which consisted of a €14.5 billion surplus in supplementary trade items, a €-7.6 billion deficit in services, a surplus of €6 billion in primary income, and a €-2.5 billion deficit in secondary income. Germany’s current account posted a €7.9 billion surplus in August 2013. Germany exported €47.7 billion in goods to EU member states and imported €44.3 million. Exports to EU countries rose by 2% compared to August last year, while imports were the same. Exports to Eurozone member states in August 2014 totaled €29.2 billion, an increase of 4% on last year, while imports came in at €30.5 billion (+0.7%). Exports to EU non-Eurozone member states totaled €18.5 billion (+4.5%), while imports were €13.7 billion (-1.3%). Germany exported €36.4 billion in goods to countries outside the European Union in August 2014, which was -4.7% down on August last year, while imports fell by -6.3% to €25.7 billion. International trade refers to countries purchasing and selling goods and services from/to each other.